BriLove -- Your ideal choice of fashion jewelry, your sincere choice for Brilliant Love. BriLove, a combination of "Brilliant" and "Love", has been in constant pursuit of superior material, exquisite design, expert technique and serious treatment of every detail of the product. We, BriLove, always value a brilliant philosophy -- help all our customers to spread their Brilliant Love to the world! *1 Moisture protection. Keep the jewelry dry and take it off when bathing or swimming. *2 Don't wear the jewelry under the sun exposure for a long time, which would cause a mild corrosion phenomenon. *3 Every time after wearing, use tissue, cotton surface or a cosmetic brush to wipe the jewelry gently, it can help to remove moisture and dirt. *4 Avoid contact with chemical agent like alkali and chlorine bleach. *5 Avoid scratching on jewelry. Don't put your jewelry overlap together. Store them in the original packaging, or in the box contains independent grid. BriLove offers you a caring warranty to protect any customer who receives defective order. Always, we will be there for you! Searching for more brilliant new Fashion or Fine Sterling Silver jewelry? Please feel welcomed to click on BriLove to visit our storefront! ♥ Material & Craft ♥: Adorned with selected Austrian Crystal, crafted with eco-friendly Zinc alloy, Lead-Free & Nickel-Free, this special design is born to match the clothes and your unique beauty. ♥ Specifications & Size ♥: Necklace: Pendant Size: 8.6*1.7 in; Chain Length (Adjustable): 20-22.8 in. Earrings (Pierced): 2.1*0.5 in. Total Weight: 76g. 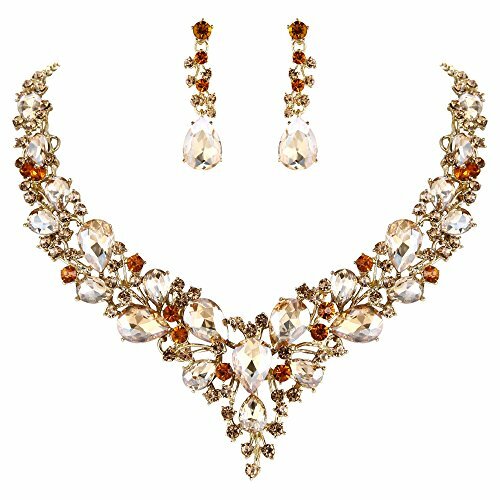 ♥ Any-Occasion Accessory ♥: Suitable for wedding, engagement, graduation, party, prom, daily wear and any event to be beautiful goddess. Searching for brilliant jewelry? Click on ♥BriLove♥! ♥ Gift To Who You Love ♥: Wrapped in an exquisite gift box. Delicate and surprise gift idea for your best friend, lover, girlfriend, fiancee, wife, mother, daughter, grandma on Christmas, Birthday, Anniversary, Valentine's Day, Mother's Day. ♥ Considerate Service ♥: Please feel free to contact us if you have any concern about this item. We will try our best to promise brilliant shopping experience to you. If you have any questions about this product by BriLove, contact us by completing and submitting the form below. If you are looking for a specif part number, please include it with your message. Sterling Silver Diamond Love Knot Pendant Necklace and Earrings Boxed Jewelry Set (1/4cttw, J-K Color, I2-I3 Clarity), 18"